So far you’ve been hearing all the good things I like about my fabulous new GE® Hybrid Stainless Steel Dishwasher. You’ve heard how much better it is than my old dishwasher, how quiet it is, how well it cleans, and all about the ins and outs of it. Well, today I’m going to tell you what I DON’T like about it. After all, what’s a fair review if you don’t point out some negatives? #1–My biggest compliant–it’s large. Not large as in actual size, but large in the fact that it holds a lot of dishes, 12 full place settings to be exact. Why am I complaining about that? Because now I actually have to sit and listen to military/war stories instead of washing dishes during family gatherings. #2–It’s got the “clean” light indicator. Now I can’t play dumb and say to hubby that I thought the dishes were still dirty and that’s why I didn’t put them away. #3–It’s quite. I know I said in a previous post that I liked how quiet it is. That was before I got stuck actually listening to some of the shows Hubby watches. I think I’d rather hear the dishwasher running! #4–You can wash a half-load. No more excuses for not running the dishwasher when the top rack gets full before the bottom one (meaning there’s more dishes for me to put away!). #5–The filters are easy to remove and clean. You mean I actually have to do that?! Ok, in all reality, I only have one negative about my GE® Hybrid Stainless Steel Dishwasher and I’ve already mentioned it before…you can’t put the taller silverware in the middle, they must go on the edges or they block the detergent door. That’s it and it’s an easy thing go get over. 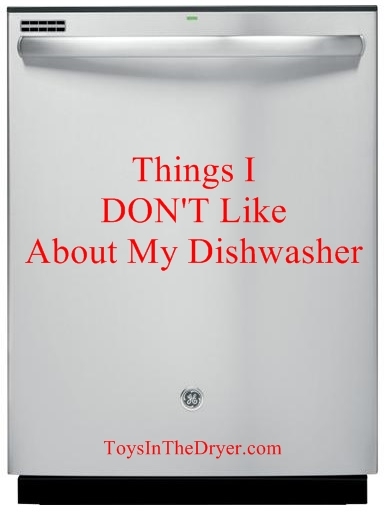 I truly DO love my GE® dishwasher! GE® provided me with this dishwasher for my review. All opinions are 100% my own.